Gault Designs is a high-quality custom steel furnishings designer and steel manufacturing plant. Our design studio and showroom is in Serenbe, Georgia, and our manufacturing plant is in Peachtree City, Georgia. Because we design and manufacture our own work, we’re able to ensure that every piece meets our strict quality standards, and the process builds strong, creative relationships with all of our customers. Come in and speak with us about steel furnishings, the different possibilities in steel and wood, or our signature clear coat that retains the natural look of metal under a protective, food-safe coating. We have years of experience providing steel solutions for commercial, and residential projects, including interior and exterior architectural features, signage, food and beverage furnishings, and we work with a variety of steel, including certified CorTen steel. Contact us to book a design consultation or manufacturing consultation with Gault Designs — please click here. For information on our Design-Build Membership Program open to professional architects, designers, and home builders, please click here. A walking tour of Serenbe with founder Steven Nygren. Every Friday, 4-6pm, with participating Serenbe businesses. Gault Designs offers a complimentary glass of wine to visitors, as does our neighbor, Hills & Hamlets Bookshop. The Biophilic Institute, Biophilic Cities and Serenbe convene national sustainability leaders and biophilic professionals each year to form new partnerships and discuss future directions of biophilic models, urbanism and design. May Day is a celebration of arts and culture. The streets of our Selborne neighborhood are lined with local and regional makers, food trucks and live music, while other visual and performing artists stroll throughout the community sharing their work and whimsy. Each year, the children of Serenbe perform a traditional May Pole dance in the middle of the festival. 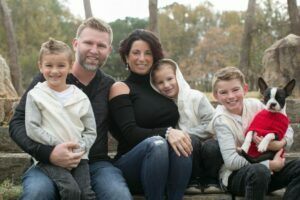 Christina Gault is co-owner, co-founder and lead designer of Gault Designs, and co-owner of Industrial Services of Peachtree City together with her husband, Justin. Christina was born and raised in Ohio. She graduated from Virginia Marti College of Art and Design (VMCAD) with a degree in Applied Business & Graphic Design. Justin Gault is co-owner, co-founder and designer of Gault Designs, and co-owner of Industrial Services of Peachtree City with his wife Christina. Justin was born and raised in Ohio. He went to school at Polaris Career Center, and is a master machinist and fabricator with years of experience honing his craft.